Sir Sandford Flemming Park in Halifax, Canada now has two towers stretching skywards, carving out distinctive vertical planes. The new arrival is not as tall or venerable as the early 20th century Dingle Tower commemorating the establishment of responsible government in Nova Scotia. Although it may be the shorter of the two, it represents a cachet of a different order altogether. 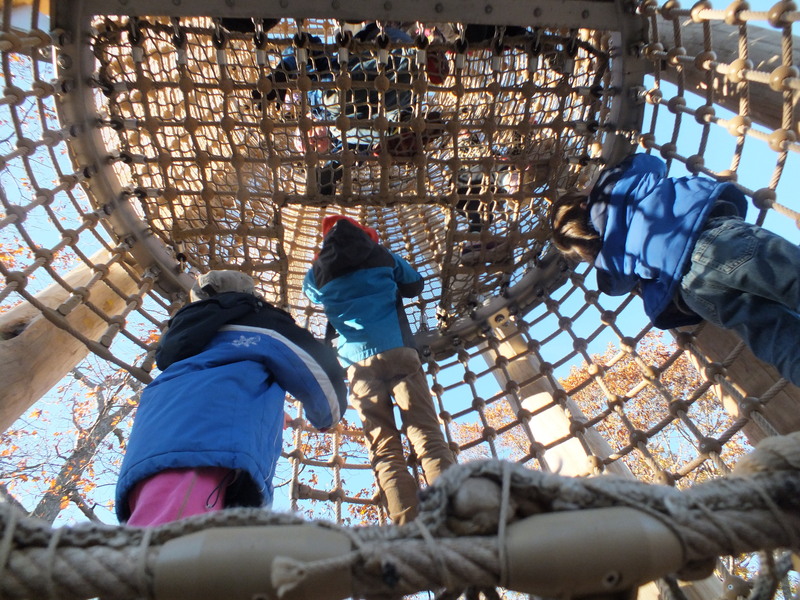 The tower of play, framed by durable and dense black locust pillars and encased in steel core poylester wrapped rope, is a hive of activity during opening weekend. The structure is a beacon, a homing signal for kids on the lookout for a whoosh of excitement. As people arrive, reactions are squarely in the eye popping, can’t believe this, wonder zone. Kids sprint toward the installations at this playscape located not far from the city’s urban core. I can hear sharp intakes of breath and high frequency, surround sound squeals of delight are registering very audibly. The tower’s hollow core is a scramble of movement. It’s like the kids are aloft in the rigging of masted sailing vessels, or scaling the walls of a medieval town. Ever upwards hand over hand on a perpendicular climb to the top followed by a rapid descent on the slide. Repeat once, repeat twice, the merriment is endless. “This is the best, it’s awesome,” shouts Lila as she looks about for her next adventure. It’s just a hop, skip and a jump away. She spies a plot of sand with a pump firmly planted close to one of its borders. It’s a popular spot and she has to wait a few minutes before she gets a turn making the water flow. The Kaiser & Kühne water pump is well primed. Lila’s enthusiastic exertions let loose a modest cascade of the clear, wet stuff. 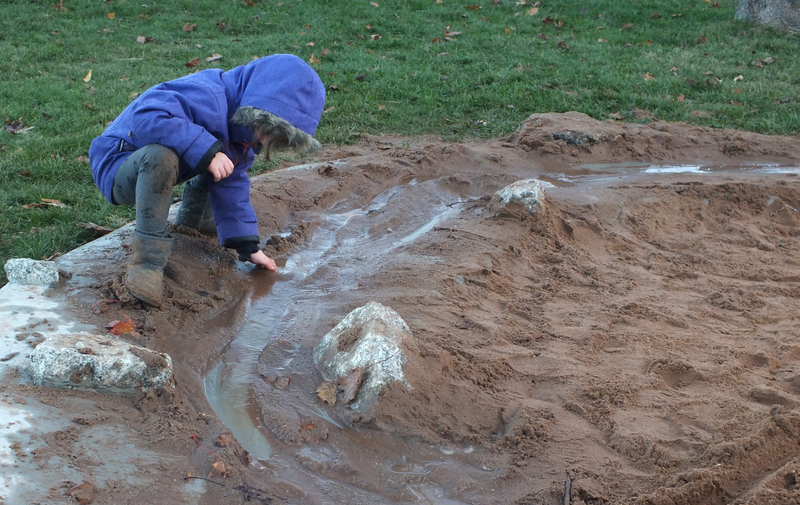 Water sprouts out the spigot and carves narrow channels as it flows downhill in the sand – magic in the making. I think back to a phone conversation I had with Cornelia Oberlander, Canada’s doyenne of landscape architecture, a few years ago. She shared with me what she had adopted as a self-evident truth borne from her decades of involvement with children in play spaces. I paraphrase her here – all children really need for play is some sand, or earth, water and a place to climb. That’s a check, check and check at The Dingle. Despite the coolish temperatures, kids are immersed in the water experience. There are soggy mittens, dark patches on the knees of pants and the squelchy sound of soakered wet footwear. The water casts a powerful spell transforming sand to muck of varying consistencies and creating ever changing topographies. There is an irresistible quality to mucky dirt and having the license to get all messied up. There is also something for the climbers, balancers and jumpers. Take a dozen or so bark-stripped logs, create a frame with upright anchors and then connect the rest on different planes, angles and inclinations. Think levitating 3-D pick up sticks with netting underneath. This logs akimbo installation offers challenge, fun and a little risk depending on how adventurous the child chooses to be. There are a number of different techniques on display at the climber – the straddle hop, the creep and crawl, the slither, the sure-footed mountain goat, the bear hug and the koala. Kids find their own comfort zone and move accordingly. Inching along with arms and legs wrapped tightly around a log à la bear hug seems to offer the greatest security particularly for the younger children. The netting at the climber’s base is a great spot to goof around, crawling under, wobbly balancing with feet on rope, lying back and taking in the big, blue sky. And let’s not forget jumping, the airborne launch from the climber’s highest heights and getting pulled oh so quickly back to earth with a small, soft thud. 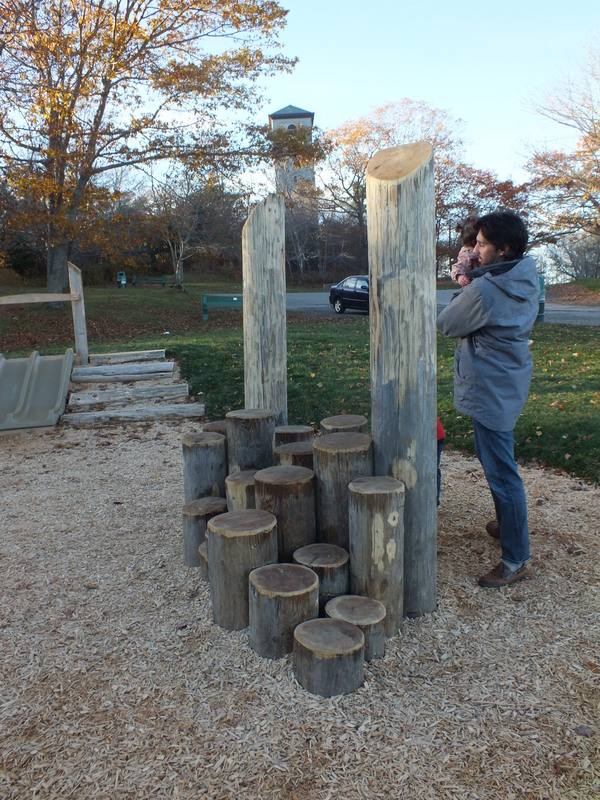 There’s more – a balancing log with bark intact, the ‘easy as 1, 2, 3’ climbing bars, a small embankment slide, a stump stairmaster cluster, a tyke sized climber next to the water pump and the don’t try this in enclosed spaces #playrocks percussion station. Lots to do, try and experience that encourages physical activity and the development of gross and fine motor skills for a wide range of ages. This natural play area, by Canadian design and build firm Earthscape, is a welcome departure for urban Halifax where there has been a bit of a blight on the variety of play opportunities available to kids in public spaces. 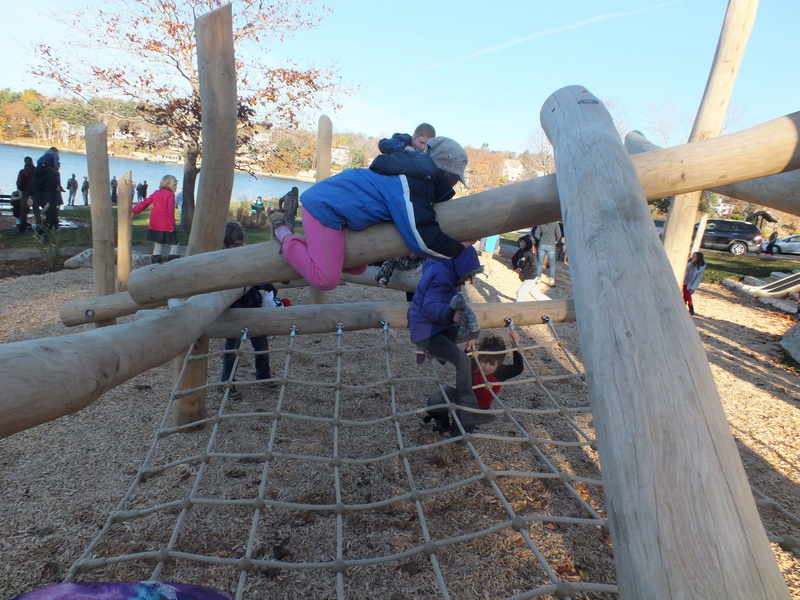 A notable exception to off the shelf solutions over the years are playscapes on the waterfront which have benefitted from the leadership of the Waterfront Development Corporation and co-funding models. 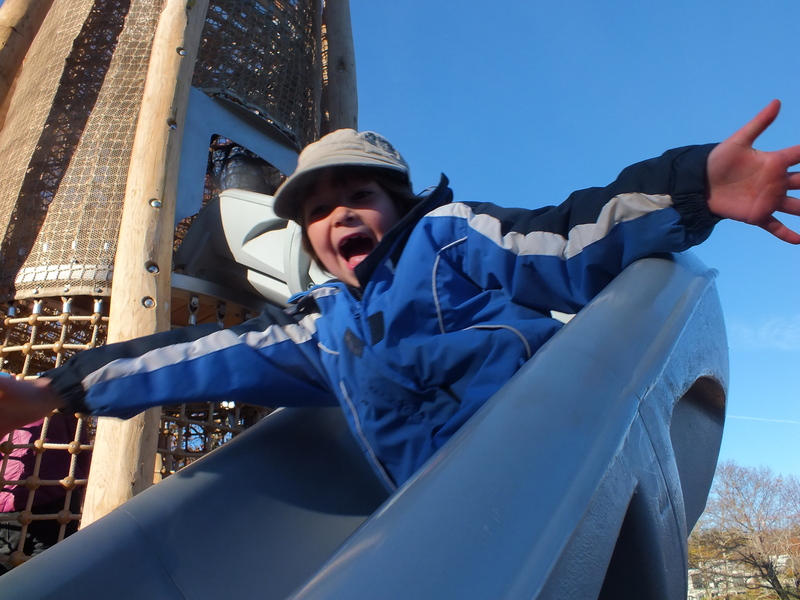 Earthscape’s Dingle playground may offer a compelling enough example for the City of Halifax to contemplate continued variety and the creation of additional signature playscapes in other parts of the city. Perhaps this is already under consideration. Wouldn’t it be as easy as 1, 2, 3 to engage with a representative sample of parents and caregivers to develop an overarching plan for play in public spaces for the city’s kids? 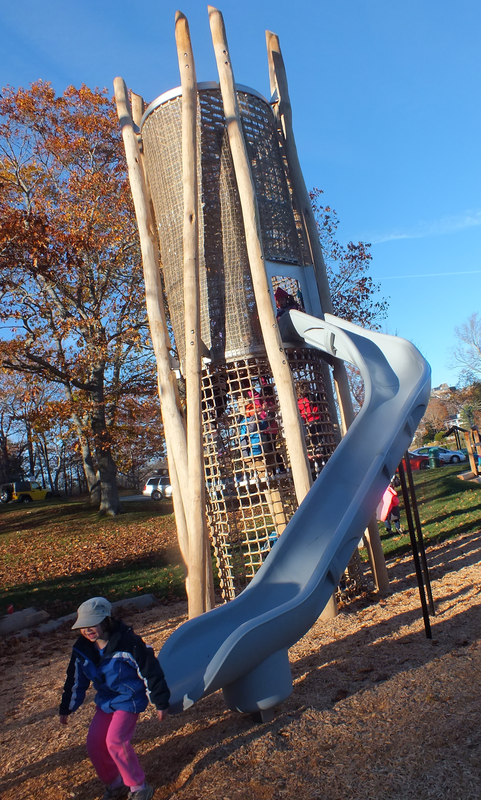 Halifax could explore and embrace the growing interest in adventure playgrounds. Are these the city’s first steps in connecting the 3 Rs – risk, resilience and the renaissance of play? Anyone with kids should take a dangle down by The Dingle. We had a great time and will certainly be returning even though it’s a 40 km return drive from home. Towering oaks, the Northwest Arm, wooded trails and the new natural playscape make this urban oasis a great place for play. 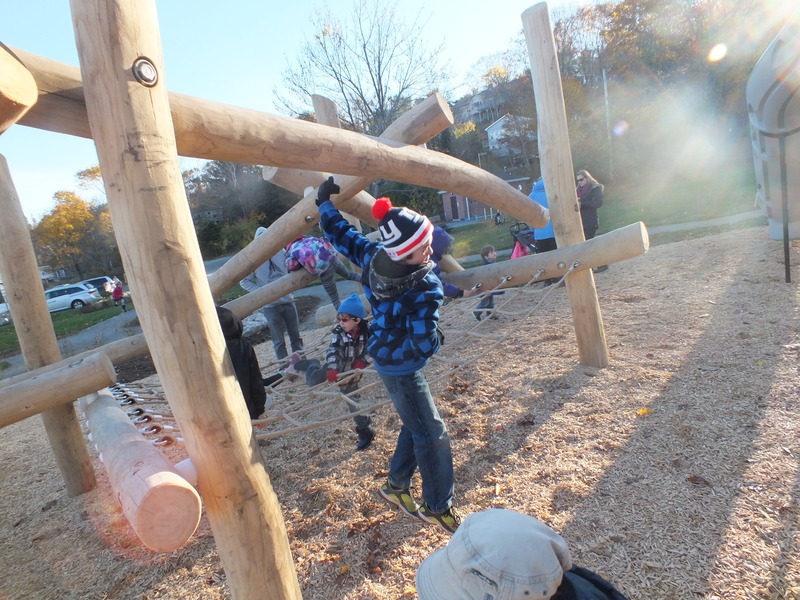 Thanks Earthscape and kudos to the City of Halifax for exploring new dynamics in public play spaces…. 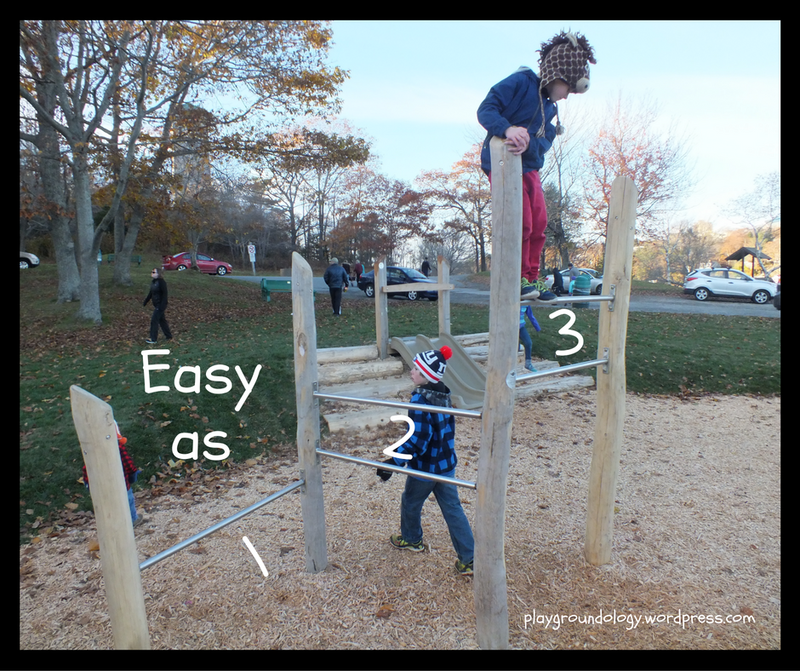 This entry was posted in Earthscape, Halifax, natural play space, Natural Playscapes, nature play, PlayGroundology, The Dingle, Tower slide, water play. Bookmark the permalink.